After writing my year-end movie wrap-up, Favorite Movies Watched in 2017, recently, I had one of those middle-of-the-night realizations (am I the only one who does that?) - I hadn't reviewed Hello, My Name is Doris last year! Somehow, the review fell through the cracks, which is a shame because it probably would have taken the prize for my favorite comedy last year. I watched this warm and funny movie with my two closest friends, and we all loved it. Sally Fields stars as the 60-something Doris and steals the show in this fun, quirky role. As the movie opens, Doris has just lost her mother, whom she lived with and cared for her whole life. She is on her own for the first time and has lots of neuroses, including never throwing anything away and living in the midst of clutter. She works in an office, and someone new comes into her reclusive, habit-driven life when a new art director is hired. John, played by Max Greenfield (Schmidt on The New Girl), is hunky and kind to Doris. After a lifetime of reading romance novels, Doris is primed for true love (or lust) and falls for John, despite his being decades younger than her. Her best friend Roz, played by Tyne Daly, thinks she has lost her mind, but Doris' world is opening up for the first time. She is scared but also excited and enlists Roz's granddaughter's help in stalking John online. They discover that John loves a certain band that is playing locally the following week, so Doris goes to the bar where they are playing, sees John there, which leads to even more new experiences. My friends and I just loved this warm, hilarious movie. Sally Field is perfect as Doris, with her wigs, brightly-colored clothes, and her infectious and growing enthusiasm for life. It's so much fun to see Doris' world opening up, as she explores her freedom for the first time in her 60+ years. It's an earnest, heart-warming, and very funny movie that is filled with joy. This is a great movie to watch when you need a lift! 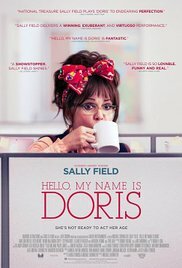 Hello, My Name is Doris is available for free on Amazon Prime streaming or on DVD. It is available through Netflix only on DVD, not streaming. That looks like a good movie. I've always liked Sally Fields. Me, too! Sally Fields is great in it. I do that all the time and still have books & movies that I never reviewed. I saw this movie in April of 2016 and LOVED it. So did my friend. ha ha - same, Vicki! Glad you enjoyed this one, too!